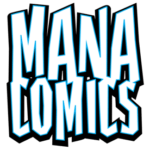 Chris Caravalho is the founder of Mana Comics and creator of ‘Aumākua Guardians of Hawaii. A native of Oahu, Chris strives to incorporate and celebrate the cultural and ethnic diversity which make up present-day Hawaii into his work. When he isn’t busy with comics, Chris is employed fulltime as a police officer with the Honolulu PD. This month, he sat down with Indyfest to discuss his comics and the road he’s taken to get them out to his readers. IM: How long have you been creating comics? CC: It’s been two years now. IM: Tell us a bit about yourself. Where did you grow up? CC: I’ve worked fulltime as a police officer in Honolulu for nearly 18 years. I was raised on the island of Oahu, Hawaii… in a beach town called Kailua. IM: Anything you’d like to share about your childhood? IM: How did you get interested in comics? CC: Ever since I could remember, I was a HUGE fan of Saturday Morning cartoons and comics. I can remember as early as preschool, I was trying to draw superheroes. Because I lived in a strict house, I had to enjoy my passion in secret. I was the king of couch coin collecting and would take the change to the spin rack at 7-11 to get my fix. The sneaking of my Marvel and DC contraband into the house was always a challenge. I remember many nights, zipped and sweating in my sleeping bag with a flashlight, being awed by super heroic adventure and nearly passing out from heat. IM: What steps have you taken to further develop and hone your craft? CC:I think realizing that I couldn’t do it all myself was key. My job takes a lot of my time. Thankfully, through the power of networking, I found an outstanding creative team. IM: Who would you consider to be your influences and inspirations? CC: There were several teachers that inspired and nurtured my creative side. I think, as a kid, I felt stupid because I had a really hard time with math. Word problems are still the devil. Thankfully, those teachers allowed me the freedom to create and use my imagination. It gave me the confidence that I lacked, because I felt that drawing and writing was my strength. 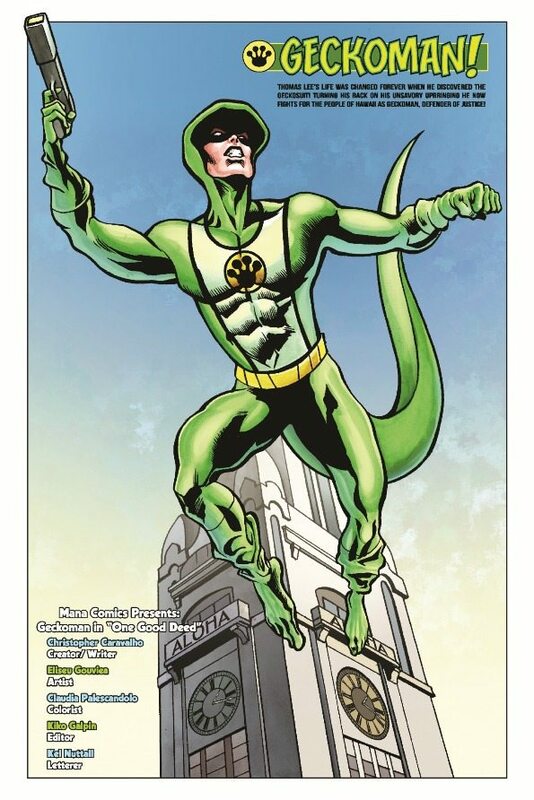 As far as local creators, a HUGE inspiration for me is Sam Campos, the creator of Hawaii’s first superhero, named Pineappleman. He was the pioneer that proved that you could create a true local superhero without having it be watered down for mass appeal. IM: You are the creator of ‘Aumākua and recently completed a successful Kickstarter for ‘‘Aumākua #3. Who, or what, are the ‘‘Aumākua ? CC: Years ago, brave men and women with extraordinary Mana formed an alliance to protect the people of the Hawaiian Islands. Present day, a new team carries on the traditions of their predecessors. They are the ‘Aumākua . ‘Aumākua is a Hawaiian word. ‘Aumākua are protectors, ancestral spirits, family or personal gods. In our Hawaiian culture, there are stories, myths, and legends of champions and demigods that roamed the islands long ago. In the Mana Comic Universe, I wanted a super hero team from Hawaii that represented the faces and many cultures of Present Day Hawaii. The newly-formed team does just that. IM: Was there anything specific that sparked your imagination and prompted you develop this series? CC: I was the shy geeky kid in class. I learned that a great icebreaker was to draw. Soon, other children would approach me and start talking. I eventually had a group of mixed-nationality friends and started drawing them as superheroes. Little did I know at the time I was laying down the foundation of ‘Aumākua . Twenty-plus years later, that idea still stuck with me: to create a group of heroes from Hawaii with different ethnicities, coming together for the common good. IM: What can you tell us about the characters? Who are they? What drives them? What makes them tick? CC: Royal Hawaiian Guardian: Has been the heart of every ‘Aumākua group that has ever been formed. He is a fierce warrior and brilliant tactician. Geckoman: Is a reformed thief, now costumed hero. Sistah Shark: A wahine måno demigod… whose bite is worse than her bark. Portuguese Man O War: Armored genius with a shocking arsenal. Seoul Hot: Roller-skating foulmouthed fire starter. Mighty Moke: Self-proclaimed Hawaiian Supahman. Super Size Sole: Polynesian Powerhouse. Phantom Surfer: Mysterious wave rider and protector of the Pacific Ocean. IM: Can you give us a brief overview of the kinds of adventures they’ve had so far? CC: Thus far, they have battled a rampaging sea creature and the world’s greatest heroes —the Supreme Team—who are not what they appear to be. There also has been an unseen hand out to destroy the ‘Aumākua , and this villain will make his first appearance in Issue #3 of the series. IM: And you’ve also launched a spinoff series, Sistah Shark and Gecko Man. What can you tell us about it? CC: Doing a two-in-one comic about solo adventures from characters of ‘Aumākua was a risky move. Thankfully, family, friends, and fans pledged and Mana Comics Double Feature was made. In a team book, it’s hard to grow attached to a character, because the spotlight is continuous and doesn’t focus on one character. 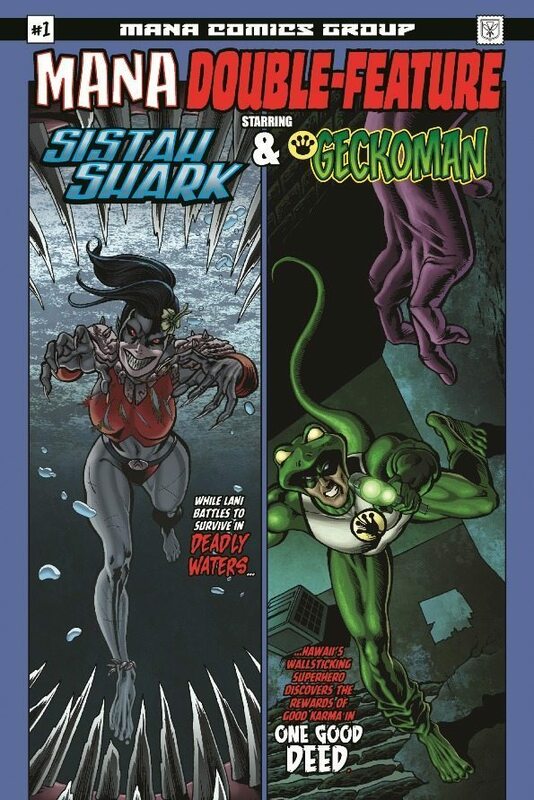 Mana Double Feature #1 offers an inside look at the origin story of Sistah Shark, and a day in the life of Geckoman. The response has been positive and I’ve been contacted by several fans who love the characters even more. 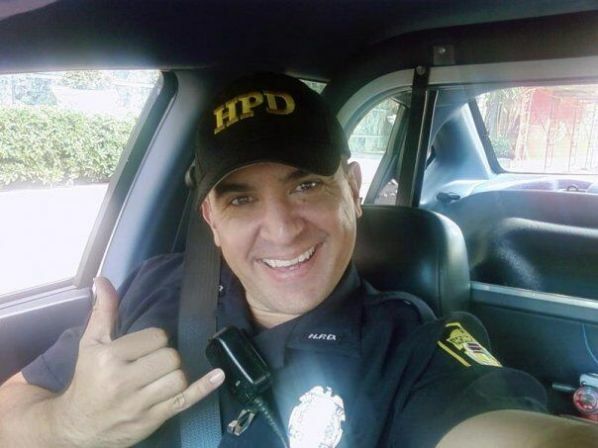 IM: In addition to creating comics, you’re also a member of the Honolulu PD. How would you say that your police experience impacts/influences the stories that you’re telling? CC: As a police officer I really have been exposed to many people in crisis. I’ve seen many horrendous and sad things in my career. But I also have seen the good in the most unlikely people. There are people who’ve had a hard life and, because of their personal pain, they lash out at others or do drugs. They can be written off as hopeless cases. I like to look at them as underdogs. I created a character inspired by these underdogs called Mighty Moke. Mighty Moke had very rough beginnings living in poverty and raised by an abusive, drug-addicted mother. In his late teens, he discovered a mystical pendant granting him extraordinary power. Mighty Moke is really rough around the edges and may be judged as a local uneducated punk. What readers will eventually see is that Mighty Moke has a big heart, is much more than they could possibly imagine, and has the potential to be a great hero. IM: How did you hook up with your creative team? CC: I met my team through networking. A key to assembling a group is to immerse yourself in the culture. 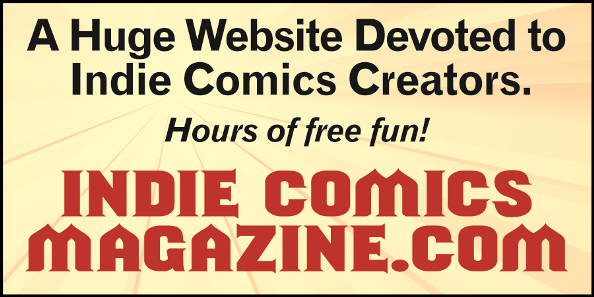 Discover like-minded individuals who share the passion of comics. I started to FB-friend a ton of indy creators, artists, and writers. I also made a call out on Craigslist and Deviant Art. It really takes a level of trust, though… to ensure your selection will meet deadlines, are assertive, and can feel comfortable sharing their ideas to make the project better. IM: What can you share with us about them? CC: Kris Lohman is my talented layout artist. He lives in Kaneohe, Oahu, which is less than ten minutes from me. Kris storyboards the script and sketches in the panels to make my job of pencilling and inking much more quick. Kris is also co-creating another comic called the Dwarfstar Chronicles— Where Storybook meets Science Fiction. Claudia Palescandolo is my colorist. She lives in Bologna, Italy, which is the exact opposite of Pacific Time. We communicate in the early morning or late evening. She is hardworking and enthusiastic. She is also the colorist for titles such as B-Squad and Quebrada Second Fall. Kel Nuttal is my letterer, and a veteran of the comic industry for 20 years. Kel’s experience has been a lifesaver and his tips have made me grow as a creator and helped me make the comic more appealing to the readers. Kel currently travels the States with his computer and his trusty sidekick, Mr. Wooks. IM: You’ve launched four Kickstarters to date, all of them successful. Was there anything special that you did to get the word out and attract backers? CC: I think I just networked by contacting family and friends about wanting to do my childhood dream. Via emails and Facebook. Also, I think the project video showed my happiness and excitement for the comic. People love to be a part of that kind of energy. IM: How have you been marketing and promoting your comics, thus far? CC: The timing has been really perfect for me. Hawaii did not have a comic-con for, like, 20-plus years. When I released ‘Aumākua Guardians of Hawaii, it was fortuitous that four comic-cons came to the islands. I was featured on TV and in local magazines, as well. I think having a team of superheroes from Hawaii has excited and captured the imagination of many local people. IM: If someone were to approach you and ask for one piece of advice on how to launch a new comic, what would you tell them? CC: It won’t be easy… but if it’s your passion, and if creating comics makes you happy, don’t give up. It will be worth it in the end. IM: What do you think the next twelve months have in store for you, comics-wise? 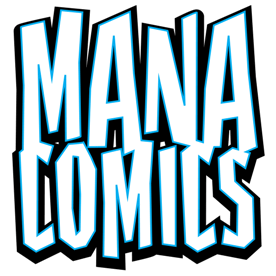 CC:I would like to expand my Mana Comics universe, by filling the ranks with more diversity and to try to add a few more titles. There is one comic—that I am working on with a fellow officer and creator Chris Koanui—that I will be releasing next year called Nightmarcher, about a supernatural warrior. I’m very excited about that project. IM: Is there anything that you’d like to share with our readers that we haven’t touched on, yet? 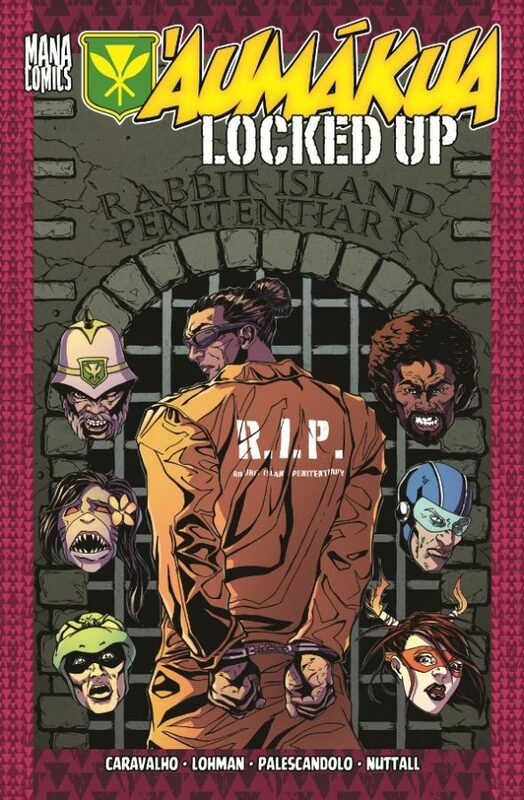 CC: If you love Hawaii and if you love Comics you will love ‘Aumākua and Mana Comics. IM: Finally, how can folks keep up with you and your work?